So, what did April have in store for me? Not a lot of reading through April. I’ve been reading a lot of Tansy Rayner Roberts work lately (see recent reviews of Musketeer Space and Sheep Might Fly), and decided to have another crack at her crime series (writing as Livia Day). I didn’t love the first book in the series (see my review of A Trifle Dead) but recent reading/listening has reminded me how much I enjoy Roberts prose, so I decided to give the series another chance with Drowned Vanilla. I enjoyed the book more than I did the first one. The characters felt more grounded this time around, and when combined with Roberts/Day’s delivery, I found myself more attached to the story. I don’t think I read much more than that through April, it was a very slow reading month. The Flash is starting to annoy me a bit. There was a recent episode where the Flash gave up his powers to save someone, only to put millions of people under the sway of a psychopathic superpowered mad-man. It was silly, and clearly done only to further an increasingly unrealistic plot. Now, don’t get me wrong – I’ll watch pretty much any superhero show and sheer bloody mindedness will probably keep me going with the series. But if it doesn’t improve soon, The Flash might have the distinction of being the first superhero show that I’ve given up on. My daughter and I have been watching the Clone Wars cartoon series and the Rebels cartoon series, both set in the Star Wars universe. It has been fun to watch something with my daughter, and we’re both really into both shows. We’re getting towards the end of the Clone Wars, so soon we’ll only have Rebels to keep us going. I’ve found that watching Clone Wars has made watching Episodes I – III a lot easier. Having a lot more story time with Annikan Skywalker when he is an actual hero makes his fall from grace more moving. There was an episode of Rebels recently where Annikan’s former apprentice comes face to face with Darth Vadar and realises who he is, and that was a lot more emotional than anything the movies have managed to produce. Lots of fun. I watched the first episode of the US TV series House of Cards and I think I’m going to be hooked. More on that later. And season 5 of Teen Wolf has come back onto Foxtel, which is excellent. I’ve rabbited on about Teen Wolf in other posts, so I won’t continue that here, but as a “Buffy the Vampire Slayer for the 21st century” type show, it has a lot going for it. And finally, I can’t not mention Game of Thrones. We’re only a couple of episodes in, and I still find it compelling watching. I can’t believe how fast the hour goes by! I’ve read a lot of critiques, and I intellectually agree with a lot of it, but I can’t deny the fact that I love watching the show. Captain America: Civil War was a great movie – lots of fun, and with very interesting fights. The last couple of Avenger movies have suffered from having bad guys who are very “same same”, robots, generic aliens etc. The fights got a little repetitive after a while. But in this movie, by pitting superheroes up against each other you got much more variety. Hero A uses Power X against Hero B, which gets trumped by Hero C and Power Y. The combinations and permutations were very entertaining. The plot was intelligent enough, and they avoided enough cliches to make it hard to guess where they were going. And of course Spiderman (my favourite superhero of all time) was a lot of fun to watch. Looking forward to some XMen action at the movies in a couple of weeks. Also, trying to pick my next Australian Women Writers Reading Challenge book. What about you? Anything juicy that you’ve been consuming? I know, I know. I said I’d only review speculative fiction books this year. I extolled the virtues of purity and staying faithful to the one true genre. I disparaged my own ability read anything else. And now I’m reviewing a crime novel. These are all well reasoned and valid criticisms, for which I have only one response, and a fairly poor one at that. Livia Day is the crime alter-ego of fantasy writer Tansy Rayner Roberts, whose Creature Court trilogy I enjoyed very much. I was interested to see what she’d done with the crime genre (and I’ve also been really liking the work coming out of publisher Twelfth Planet Press recently). Lets start with what I liked about A Trifle Dead. The writing is enviably tight, with good attention to detail. Pacing was excellent, although overall the book seemed a little long I couldn’t fault the pace of the individual chapters. I loved the use of Hobart as a character in the book (and I could only think of it as a character). Day does an excellent job conveying the sense of the city, and for those of us on mainland Australia used to thinking of Tasmania as some kind of backwater, it was a real eye opener. I would imagine that the Tasmanian Tourism Board (if such an entity exists) would be promoting the hell out of this book. It made me want to visit (and I didn’t even go to Hobart when good friends were on assignment down there for a few years. I just always assumed they’d prefer to return to civilisation for any catch up, and only saw them when they visited Sydney. I missed an opportunity I think). But this is where I came a bit unstuck – Hobart was the only character I built any kind of relationship with. Don’t get me wrong, there is absolutely nothing wrong with Day’s writing of the characters. I just didn’t like any of them much. The protagonist was a bit irritating, the love interests a bit dull, the best friend a bit meh. There were a couple of minor characters that were vaguely interesting (the protagonist’s house mate for instance), but they were few and far between. I just couldn’t connect. I found myself rooting for the bad guy, and unless there was a level of plot subtlety that I missed, I’m pretty sure I wasn’t supposed to. Now, I’m not a “foodie” and I don’t usually read crime, so I 100% admit that I am not the target audience here. My wife, for example, is a foodie and does read crime and I have had absolutely no hesitation in recommending the book to her – I think she’ll love it. But for me the characters all seemed a bit… well, if I’m honest, silly. From that base, things went off track. Because I couldn’t connect with the characters, I didn’t like the dialog, despite it having an excellent level of snark. The plot twists, in as far as they pertained to the main character, didn’t hold any emotional resonance, despite being quite clever. I won’t labour the point, basically this is a well constructed book that just didn’t hit the mark for me. I still rate it reasonably well, because of the excellence of craft. But it’s not a series I’ll be following on from here (although I suspect my household will end up owning copies if I am any judge of my wife’s tastes). 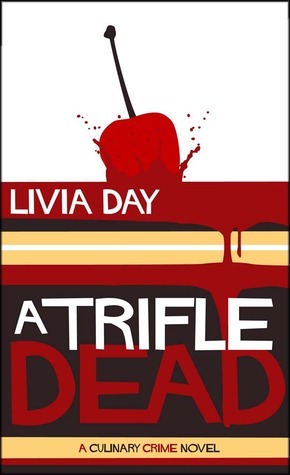 However, if you love food, you are fond of Tasmania and you’re partial to a bit of crime, ignore my recommendation above and get yourself a copy of A Trifle Dead. And leave me a comment telling me what you think! (1) OK, I’m not sure of the phonetic representation of a raspberry. That’s going to have to do. I’m sure you got the general idea.